Man! Do I hate tiling. I’ve made a particular effort in this house to minimise my tiling – hygiene board in the shower, cladding in the family bathroom, glass splashbacks in the kitchen...but there was no escaping the small amount of tiling required above the teeny weeny sink in the ensuite. 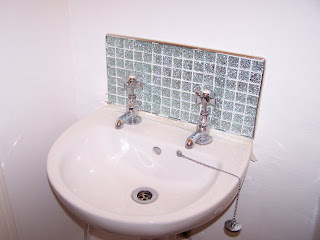 I chose lovely sparkly mosaic tiles and put the job off for weeks because I knew reaching behind the taps whilst trying to juggle tiles, trim and grout would be a nightmare. There was no tile adhesive – I had bought grout by mistake. I only bought two finishing corners instead of four. The trim didn’t fit once I had the whole sticky mess on the wall. I had one child screaming himself to sleep whilst the other shouted for me to look at his game. Even Project Manager didn’t help as he proclaimed that I had done it wrong! I was expecting to do a disastrous job grouting this evening but luckily the adhesive has to dry for 8 hours first – I might finish the job tomorrow!